This two bedroom home is neat as a pin and situated on a fertile and productive 50.5 acre farm and is sure to draw the attention of anyone wanting to kick-start their farming dream, or add to an existing enterprise.The brick home has a generous open-plan living area – the kitchen is original from when the home was built in the 80’s but is in near-immaculate condition and a modern Chef stove is an added bonus. There’s a reverse-cycle Daikin aircon in the loungeroom and a verandah out the front to enjoy your views. The upstairs bathroom has undergone a renovation and the carpets are in good condition too. Both bedrooms are generous in size and enjoy views over the creek out the front and surrounding farmland. An internal staircase leads you downstairs, where you’ll find the laundry and an extra loo and shower, along with two garages (one on either side). 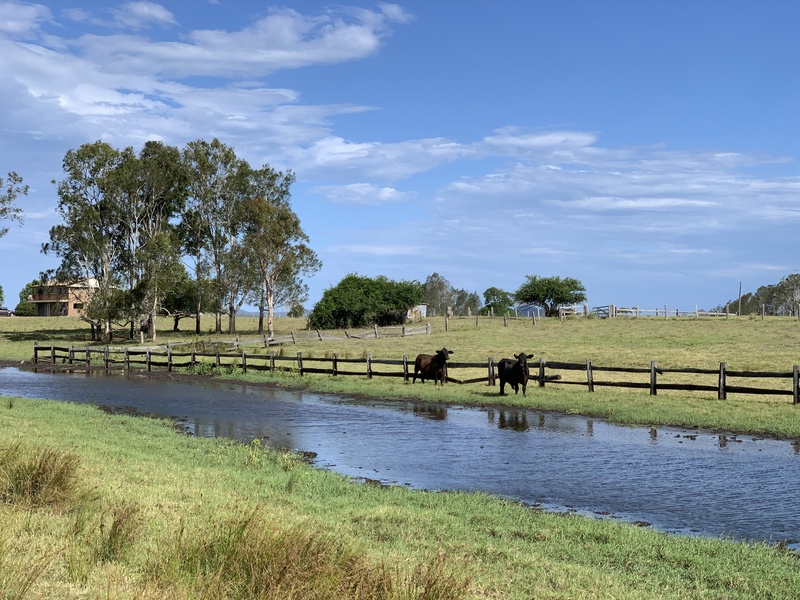 The 20.44Ha has a mix of kikuyu, couch, clover, and paspalum pastures and there is a dam out the back, town water connected to stock troughs, and frontage to Alumny Creek at the front of the property. The property is currently running about 30 steers/bullocks to fatten and is carrying them very capably. The timber yards are quite dated and there are a number of old outbuildings on the property. There is also a small mound near the house which is apparently above previous flood levels. Our vendor has owned this property since the 1950’s and has called this little piece of paradise home for nearly four decades, and you sure can appreciate why it’s been so tightly-held. After many years of enjoyment here, it’s time to see the keys handed on to the next lucky owner. This property is identified as Lot 371 in DP 751390. Clarence Valley Council rates are approx $1,010 per annum and the property is in an RU1 zoning. Inspection is by appointment only; please phone JoJo Newby on 0417 690 637 to discuss further.